A couple years before I graduated, I met a fellow student in the grad school computer lab. It wasn't until the final months of school that someone told her how she had to format her thesis--she had nearly 700 pages she had typed using a typewriter. In order to meet the graduation requirements, she needed to re-type her entire manuscript and format it as the school required. From her panicked face, I could tell that she would probably have a few errors in her finished thesis. It was, unfortunately, the nature of the process. Finding errors in one's writing is also the nature of the process of writing. My master's thesis (a less-than-700-page novel) received comments from a few non-committee readers. For the most part, they were positive comments on a draft that I had re-worked fairly well. However, some of the readers pointed out that I had grammar errors here and punctuation errors there. Errors crop up--even for the most careful of writers. Some are errors of style (unnecessary capitalization) and others are grammar (split infinitive anyone?). Others may be continuity issues--Jude in chapter one is referred to as Jim in chapter six. 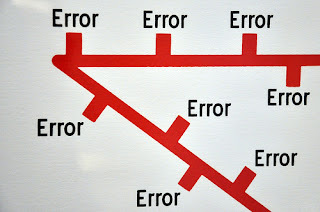 Often a writer is consistent in the errors made (which makes it easier to edit) and, then again, the writer is widely inconsistent in the errors cropping up (a bear to edit). So when are the errors too many errors? Lately I've been reading a few editors discuss this subject. No one has a good answer--there is no golden number or glaring error that sends up a red flag. But for me, there are too many errors in someone's writing when the reader is pulled out of the story because the errors are jarring and makes the reader leave the story to figure out what the writer meant. So, if you have a reader who can't get past the first few errors on the early pages, maybe you've found someone to edit your work. What errors do you notice in your writing? What errors do you notice in the writing of others? Elizabeth King Humphrey is a writer (who makes errors) and an editor (who tries not to err). Regardless, she's on Twitter @Eliz_Humphrey. Because of my difficulty, as an editor, I have compassion for my writers. I try to instruct them in ways to "see" their mistakes before they submit by making a list of the errors they make most often to check against their work. @T.K. I love your last example about the coat of the sleeve. I actually had to read it twice before my mind realized there was an error and should be sleeve of my coat. LOL. I think that is what happens so often to writers who do know the rules--we read so fast or we know what we want it to say that our minds don't even catch the mistakes. I've heard to read your ms backwards. Can you imagine? Just recently when editing for WOW!, a writer whom I know knows her rules put a YOU'RE instead of a YOUR. I read the article twice and didn't catch it when editing. Angela actually wrote to me and said, "Isn't it supposed to be YOUR?" I guess doubting since the writer and I BOTH missed it. (Right, Ang?) But that's how mistakes happen. When you get really famous, like Stephen King, there are entire websites dedicated to all the mistakes in your novels. Isn't he lucky? Love this post, Elizabeth. I'm going to share it on my Editor 911 page on Facebook. You really can't do a good edit on your own work because your mind sees what you meant to say. I'm proofing a final manu that has been through a number of eyes and one editor and finding a lot of little errors, not too bad re spelling, but inconsistencies in formatting certain terms, wrong character names (yikes!). Kinda scary. Great article Elizabeth! I usually don't run across errors in books/novels. In my writing, I have a tendency to switch verb tense and misuse 'that' often. I'm making an honest effort to improve. I wouldn't dare edit my own manuscript because the eyes are tricky. Thus, having a great editor is necessary.